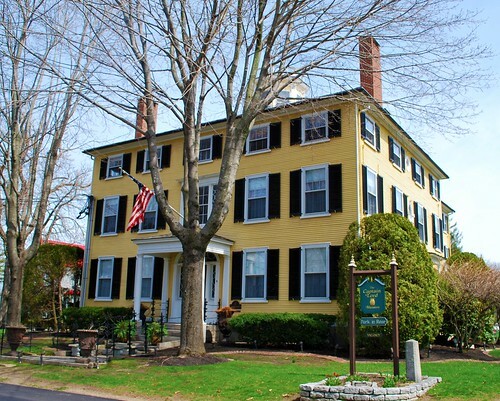 Now that I've given you a brief history of the Lord family of Kennebunkport in yesterday's post and told you why and when the Captain Lord Mansion was built I guess it's time for me to quit teasing you and show you inside the house, isn't it? Personally speaking, just looking at the outside of the house would more than inspire me to want to stay there as the classic design of the mansion really appeals to me being that I'm rather partial to the Federal style of architecture but there's also just something inherently romantic in old sea captain's houses, don't you think? I can't pass by one without thinking of the wives who used to wait anxiously for their husbands' ships to return home from their sea journeys and if you put one next to the coast with a prominent widow's walk on the roof where I'm sure many a wife paced anxiously while waiting for that first glimpse of sail, I'm even more enchanted. Honestly, I think I was born a century or so too late. Ah well, be that as it may, come on ... let's go into the mansion! From the parking area behind the mansion, one enters the mansion through this entryway on the side of the house. I'm guessing that perhaps the covering over the steps is a temporary "winter entrance" but I totally forgot to ask. Just to the left of the entrance the above plaque can be found designating the property as being on the National Register of Historic Places - a sure sign that I am totally going to love the place no matter what I might find inside! 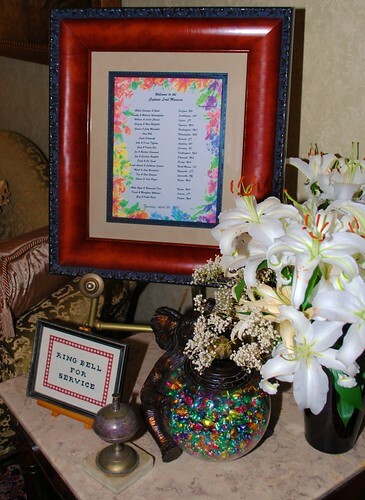 Immediately upon walking through the door I spotted the frame above that welcomed guests to the Captain Lord Mansion and listed everyone who was staying that day and where we were from. 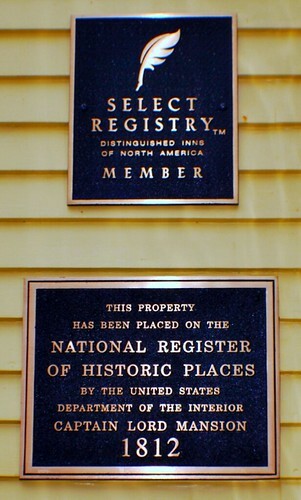 All 16 rooms at the mansion were filled with guests from Massachusetts, Connecticut, Rhode Island, New Hampshire, New York, Florida, Minnesota, Ohio, and Wisconsin. 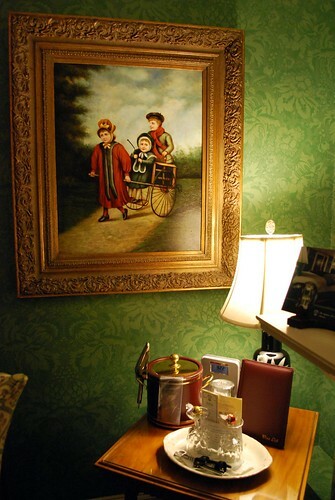 In addition to the guests staying in the mansion, there were also three couples staying at The Captain's Garden House which is a property directly behind the mansion that is also owned by Rick and Bev. 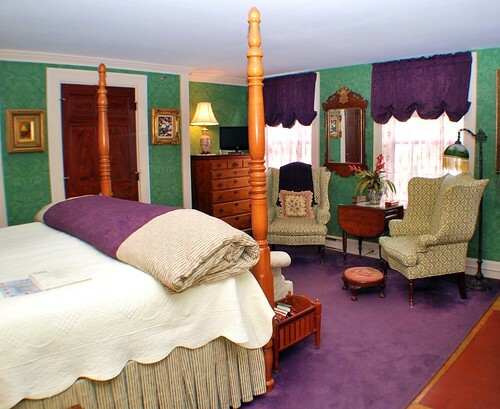 The Garden House is an 1807 Federal style home that has four guestrooms, a personal cook, and looks like another beautiful place to stay! 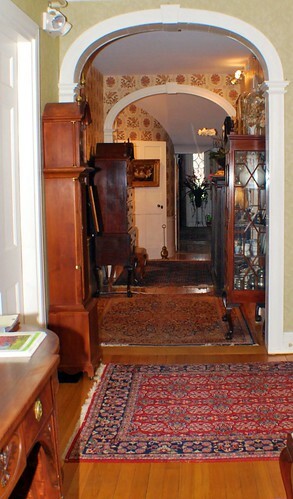 If you turn around after entering the mansion, this is the view you get of the entryway with the family tree of the Lord family on the wall to your right along with the picture of Captain Lord's great-great-granddaughter Julia Fuller at age 8 that I posted yesterday. 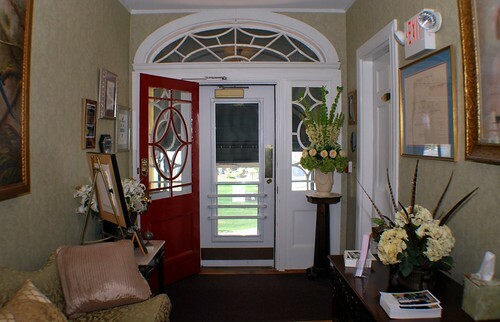 As I stood just inside the entryway taking it all in and appreciating all of the obvious attention to detail that had gone into the surroundings, I was greeted by Donna, Office Manager at the mansion for the past 12 years. After Donna welcomed me and asked if she could assist me I said something horribly profound to the affect of "I think I'm checking in." Duh? Donna, who preferred not to have her picture taken (something I totally understand! 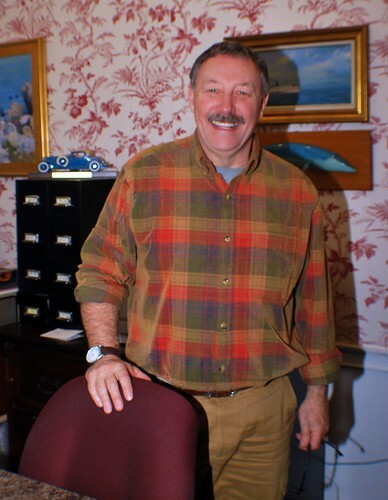 ), was training a new employee who, if I remember correctly, was named Patty and in addition to them I got to meet Rick Litchfield, Innkeeper Extraordinaire! Rick welcomed me to the mansion and said that if I wished to speak to him at all during my stay to just let him know and he'd be happy to answer any questions that I might have. I told him that I would most definitely be asking about the history of the house and other things that came to mind while I was there - which I did and he was most gracious and informative in answering any and all questions. Before escorting me up to my room, I was given a tour of the "common areas" of the mansion but I'm going to show those to you in the next installment and concentrate on the room I stayed in for this post as it warrants almost the entire post to itself! I'm pretty sure you're going to agree once you see it. 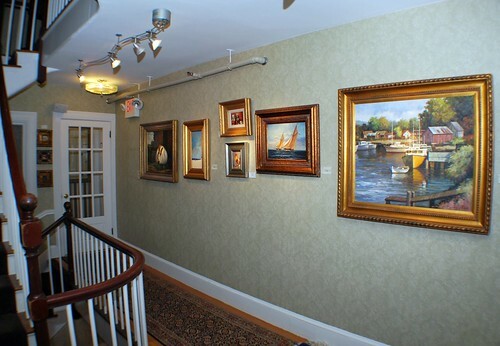 My room was located on the second floor of the mansion and as I was led upstairs I noted that the walls looked more like an art gallery with all of the beautiful paintings that adorned it. The paintings are almost all for sale, too, if you happen to see one that you particularly like and want to take home with you. I saw several that I really liked but alas my finances don't exactly inspire art-collecting so I had to leave them there for someone else. Rats. 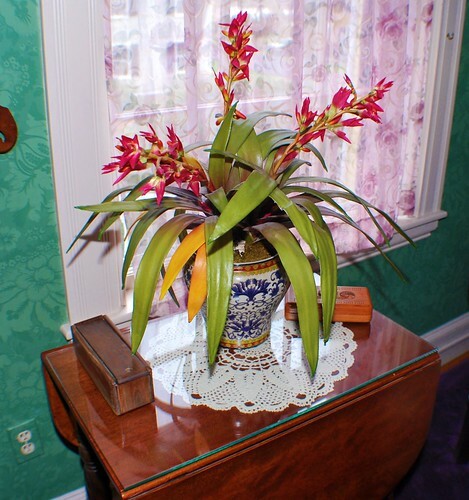 Bev Davis, Rick's wife and partner, has added lots of detailed touches to the mansion and they are easy to spot on every floor of the mansion. 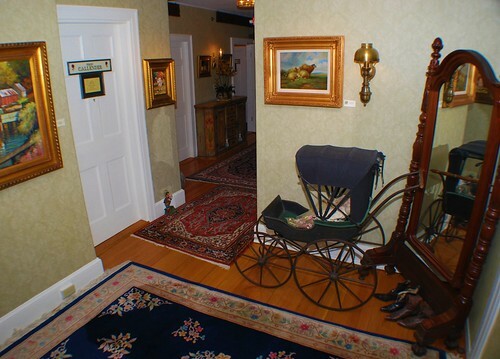 This antique baby carriage and mirror are located on the second floor just before the stairs leading up to the third floor. There are beautiful plush Oriental carpets cushioning your feet everywhere in the mansion over the gleaming wood floors so it's really easy to feel pampered even before you're shown into your room. My room was behind the door below which was directly across from the carriage and mirror above. 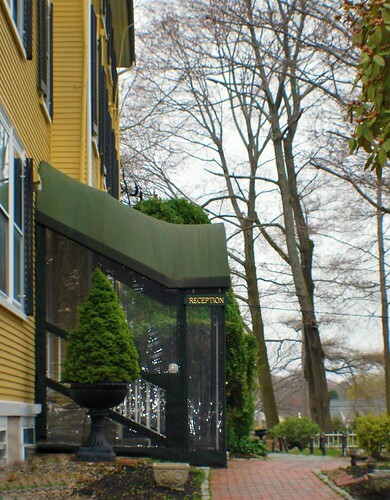 Even though I didn't have Jamie with me on this trip to pose outside of the door to my room like she has done for all of our stays at the Hawthorne Hotel in Salem, I felt like I should take a picture of it anyway as it just didn't seem right not to! 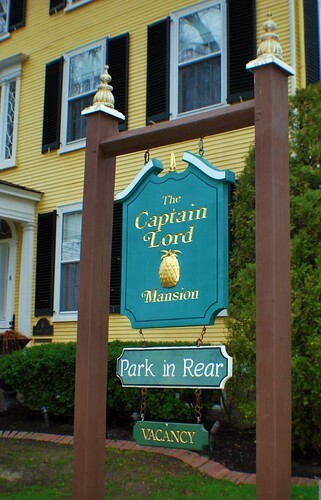 I should mention here that all of the rooms at the Captain Lord Mansion are named for ships that were owned or built by Captain Lord or one of his sons. As he was only 39 when he died he didn't have 16 ships of his own but several of his sons carried on the tradition and it was from them that Rick and Bev were able to have enough names for all of the rooms. 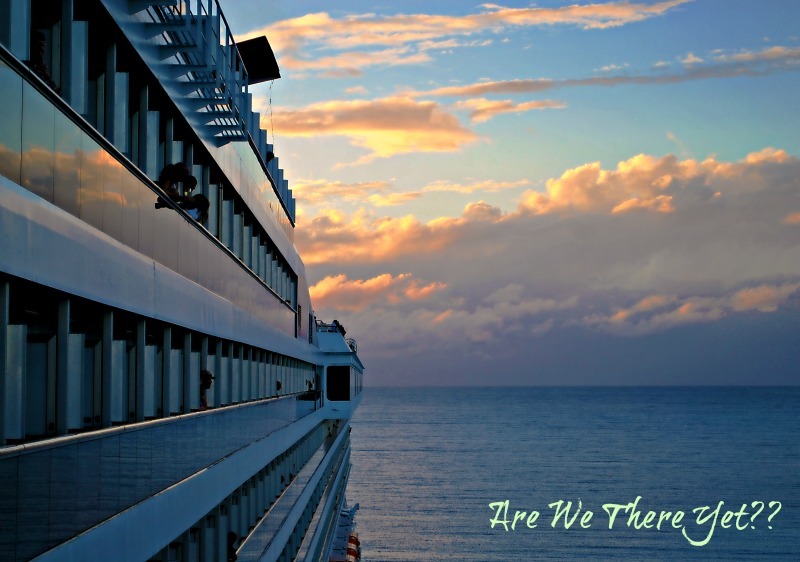 Each room has an explanation on the door of the ship that it was named for. 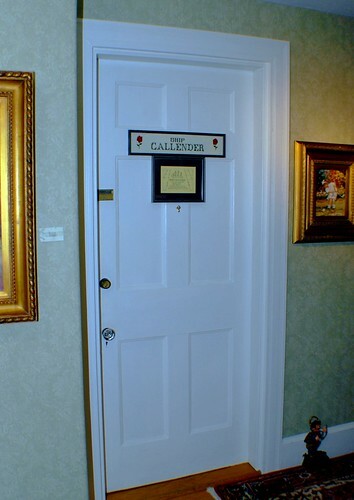 My room for the night was to be the Callender Room which is named for the Ship Callender that was owned by William Lord, Jr. - Captain Lord's illegitimate son who went to sea when he was about twelve years old and became a master of a vessel before he was twenty-one. At age thirty-one, he retired from sailing the seas as master of his own ship and was then engaged with G. & I. Lord, George Callender & Co., George C. Lord & Co., and others in building vessels at Kennebunkport*. 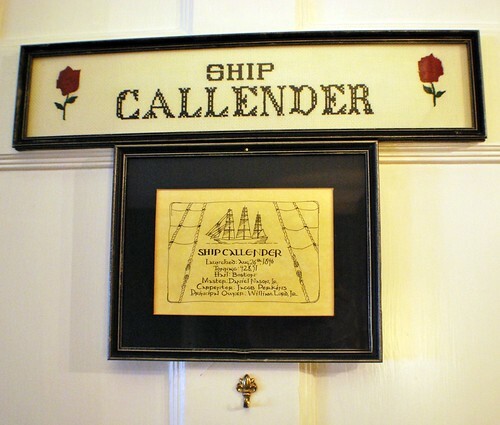 The Callender, hailing from Boston, was launched on August 26th, 1846 with Daniel Nason, Jr. as her master. 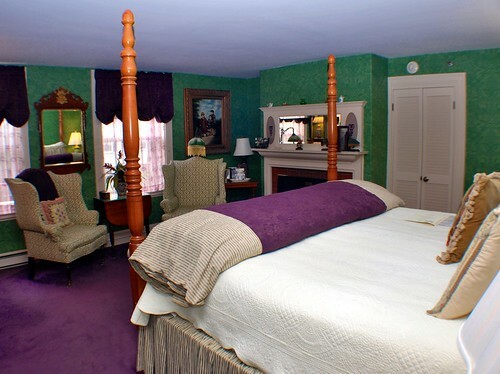 As Donna unlocked the door to my room and opened it for me to step through it was kind of hard not to gasp out loud at how beautiful it was but I think I settled for a big smile instead as I was greeted with my favorite colors of purple and green in a room that can only be described as WOW! One picture alone is just not going to do it so I've provided some from several different angles so you can see exactly how gorgeous of a room it is. 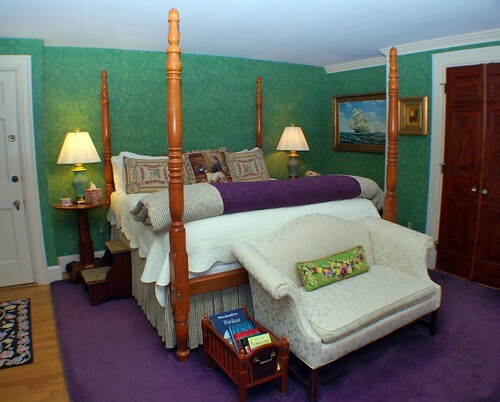 Obviously the central part of the room is the king-size four-poster bed that's so high one has to use a stepstool to climb up into it but if I thought the bedroom itself was grand, I was in for even more of a treat as Donna showed me all of the features of the large bathroom that was located behind wooden double doors. 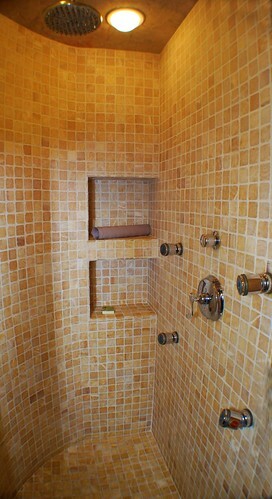 As she told me about the heated marble floors, the four-head hydro-massage shower, the comfy robes, the European-style lighted make-up mirror, the various soaps and lotions, and the sinfully plush towels that were simply waiting for me to make use of them I kept thinking that things just kept getting better and better! 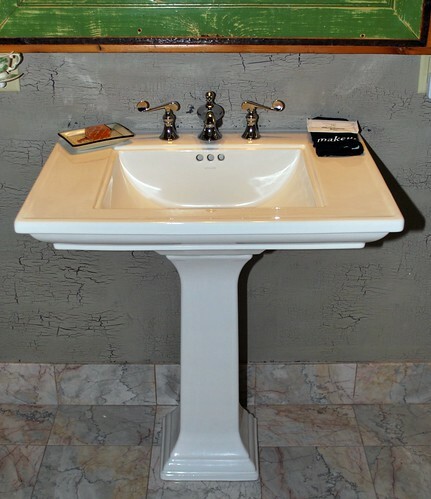 Donna took the time to point out all of the room's other amenities before she wished me a wonderful stay and said that if there was anything at all that I needed, I merely needed to ask one of the staff and they'd see to it that my every need was met. Honestly, a girl could really get used to this! After Donna and Patty left me to enjoy and explore some more of the Callender Room, I made sure to take lots of pictures so that not only I could show them to you but so I'd have them to remind me that I had been given the chance to stay in the true lap of luxury at one point in my life! 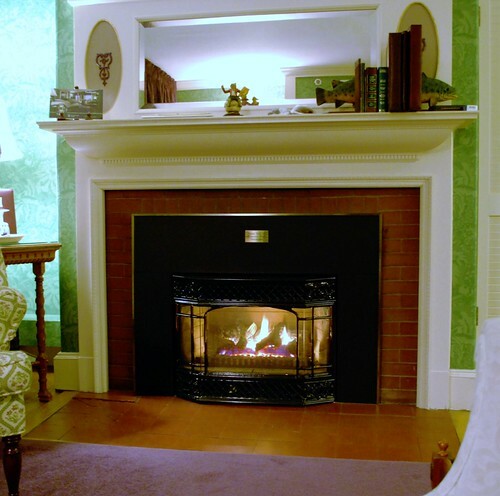 Each room at the mansion has its own gas-burning fireplace and sitting area. 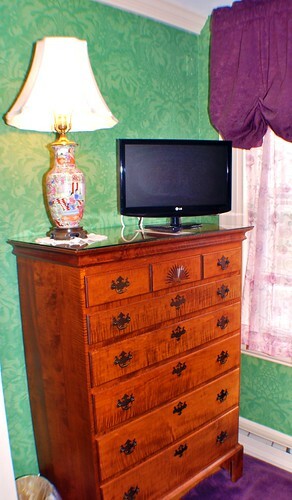 Rooms also have a small flat-screen TV with cable and complimentary wireless internet - which works great by the way! 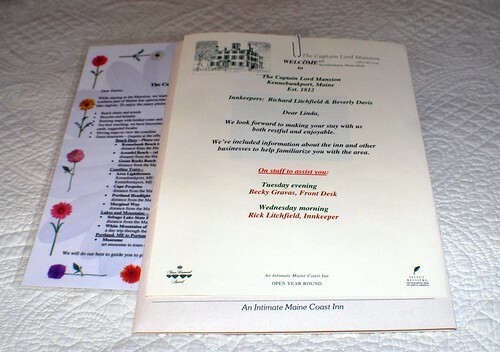 There are special little touches like live plants and assorted games - cribbage and cards were in the boxes on my table. 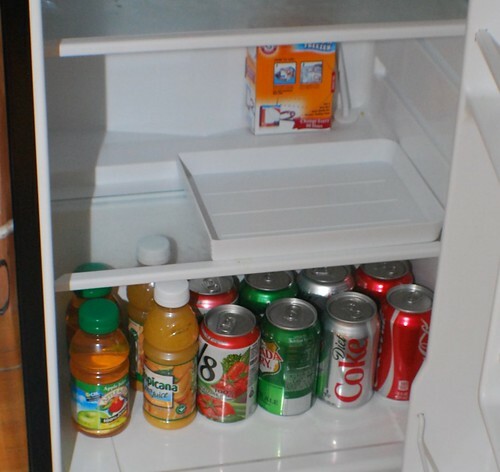 A mini-refrigerator stocked with complimentary juice, soda, and water is there for your convenience. 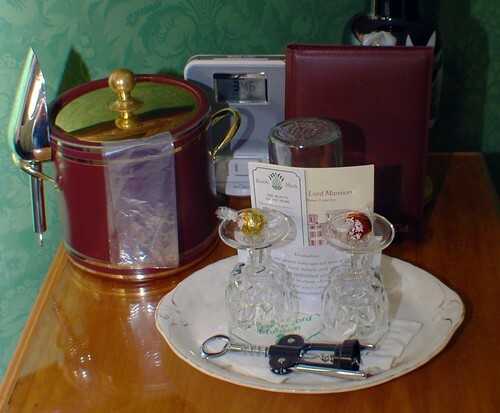 Amenities like chocolates, wine glasses, a corkscrew, a CD player with romantic music should you desire it, and an extensive wine selection are all at your fingertips. 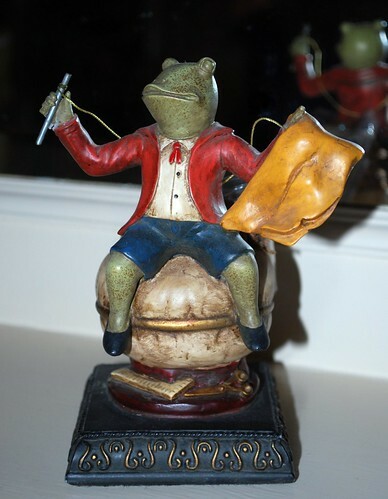 On my fireplace mantel was the whimsical frog figurine above and a beautiful postcard of the room itself below as well as several books with information on the general area and places of interest that I might want to see during my stay. Of course I had to try out my fireplace which put off a nice bit of heat while definitely adding to the ambiance of the room and made me wish even more that I had someone special to share all of this with. Ah well, I wasn't going to dwell on that, I was simply going to enjoy my stay to its fullest! Even though I was sorely tempted, I managed to restrain myself from jumping up on the bed no matter how inviting it looked as I was pretty sure that if I did and found out that it was as comfortable as it looked that I'd never get around to checking out the rest of the mansion and I knew that there was a lot more to see outside of my room. In all honesty, though, I could have simply stayed in my room and looked at this painting for hours on end as I really liked it. 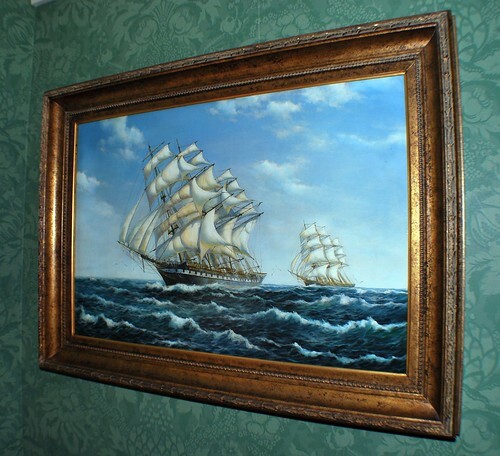 I don't know why but I have an affinity for the sea and for sailing ships and this painting just pulled me in. It would look perfect hanging over the mantel of my fireplace here at home but I guess I'm just going to have to settle for looking at the picture of it instead as I sure the heck wasn't going to try to take it home with me! If I had walked into the Captain Lord Mansion feeling simply like a person with a blog who likes to travel, take lots of pictures, and then write about my trip, I left there feeling more like an honest-to-goodness travel writer - something that I would most definitely like to be if the circumstances presented themselves. Now that you've seen a small bit of the mansion and my gorgeous room for the night, next post I'll show you more of the former home of Captain Nathaniel Lord and his family both inside and out as I did eventually manage to leave my room though it was tough - very tough - but well worth it! Wow! 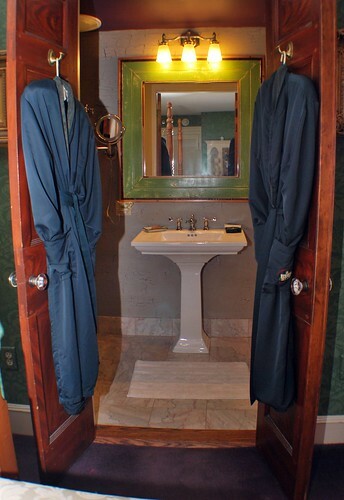 I don't know why I'm surprised at the lavish furnishings and special touches as it is a mansion after all! I knew you'd be thrilled as soon as I saw the purple! 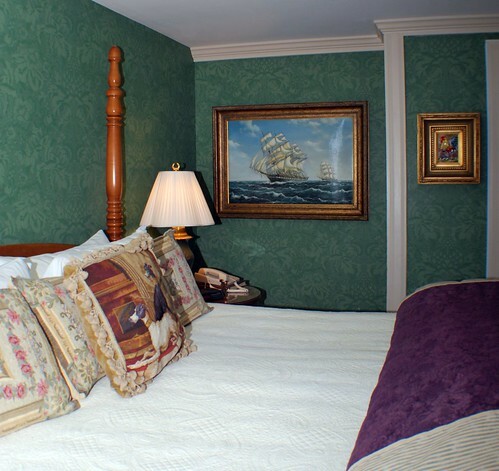 I wonder why they chose not to hang a painting over the headboard. It seems a little nekkid! Not that it takes anything a way from the room... it's gorgeous! 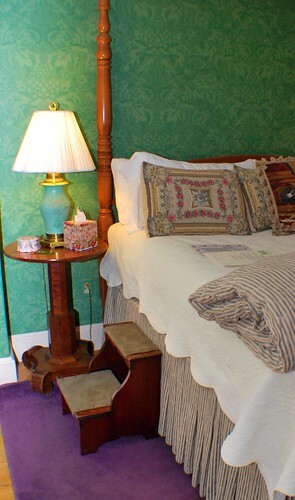 And I adore the bed stool. I so need one of those! I am a bit surprised they didn't decorate in period colors, but I do love it! It's earthly the sort of bedroom I would love to have. 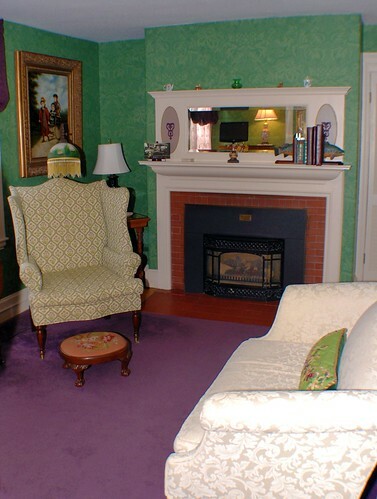 A sitting room and fireplace and lots of interesting architectural touches. hahaha! I just read my comment and I see that spell-check changed my 'exactly' to 'earthly'. Oh wow, what a treat it must've been to stay in that room/inn. Yes, what luxury! Love the purple and green. Bright, cheery, and not garish at all. 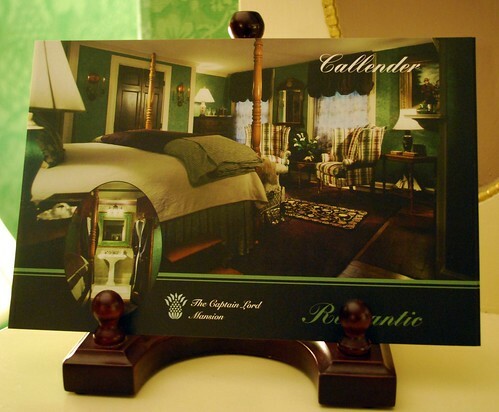 And the bed and fireplace... All I'd need is a good book and those chocolates... Pure decadence!!!!! 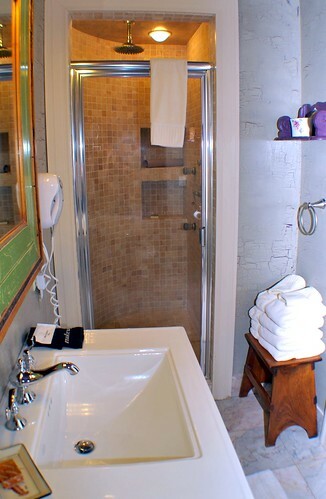 I gasped when I saw your hotel room too! Super cool, Miss Travel Writer! I know you can do this. You focus on great detail, take excellent photographs! I have no doubts you will be doing this again!! Very nice indeed. I've never stayed at a bed and breakfast before. What a great room you had. Awesome. Warm and homey is a good thing! They managed to do just that w/o making it look "countrified," or too stark like a lot of period homes I've seen in pictures in magazines. I really like it! 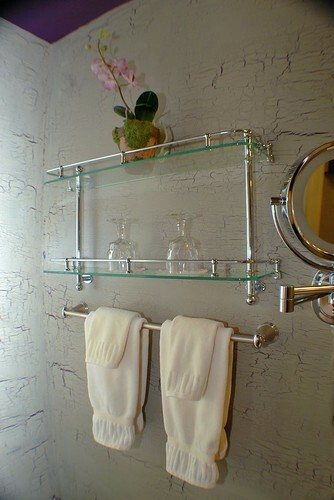 Everything is so well "appointed," and tasteful, and not over the top. These folks know their business, indeed! 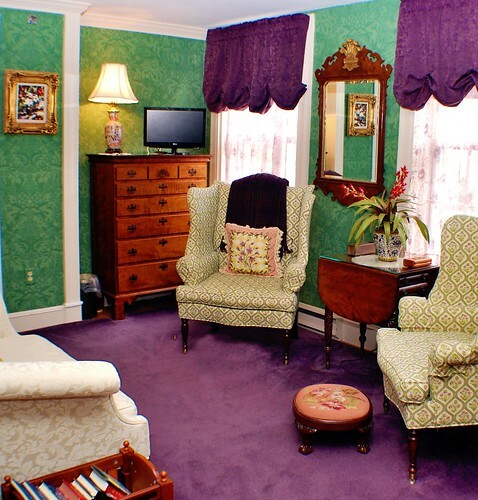 (Our home was decorated in shades of purple - eggplant - and seafoam greens. My favorites, too. Linda, I think you have an avocation!! !